This month I've been trialling another 4 skincare products. 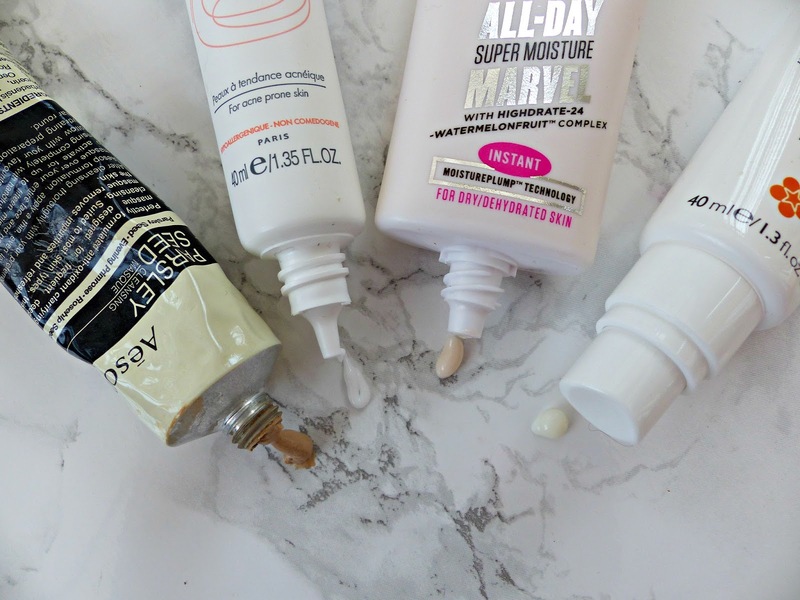 This month the products I've tried claim to combat all of my skin concerns; there's something for dehydration, for blemishes and for dullness. But did they deliver for me? I love the formula of this clay mask; it's really unusual in that it's fairly light and runny. I much prefer this as it doesn't feel cake-y or thick on the skin and isn't difficult to remove. It does have a slight fragrance but nothing too overwhelming. I leave it for 10-15 minutes to dry before rinsing. It does inevitably have that clay mask feature of drying quite stiffly on the skin but it doesn't feel like it's sucking moisture out of my skin. My skin looks and feels refreshed after rinsing this off. It feels softer, looks brighter and less tired. It offers an immediate all-round perk-up however it's also amazing on blemishes. One week in particular earlier this month, I had a really horrible hormonal breakout whilst I was away and didn't have a face mask with me! As soon as I was home I used this and by the next day the flare-up looked considerably less nasty. I carried on using it twice a week and have found that my skin is considerably clearer than it even is on average. All in all I really rate this face mask! I was really excited to try this product as Avene is one of those brands I've wanted to explore more and as I said, my skin was really acting up at the start of the month. I think due to the packaging, anti-blemish properties and it being a French pharmacy brand, it's quite natural to compare this to La Roche-Posay's Effaclar Duo +, however I do actually think they're quite different. This is quite a light, fluid formula and I've been applying it every morning. It sinks in really quickly and whilst it doesn't leave my skin feeling sapped of moisture, it does leave a bit of a matte finish. For me the LRP Effaclar Duo + is more for fading old scars, whereas this is more for when you're breaking out now and you need to clear up your skin quickly. So they both have a place in my skincare routine; I use one in the morning and one before bed. This is soothing, antibacterial and gentle and can help clear up breakouts as quickly as overnight. If (like me!) you tend to get quite sudden, bad breakouts it's an absolute must. I wasn't sure what to make of this moisturiser, which is billed for 'dry and dehydrated skin', however I thought I'd give it a go. It's been a surprise hit for me as, although my skin gets dehydrated, it's definitely combination as opposed to dry. Whilst it moves more towards normal (but still blemish-prone) at this time of year, really rich moisturisers just don't work for me. However this has a nice light, fluffy texture. I've been wearing this on days when my skin is feeling tired and thirsty and it's adds the perfect injection of moisture. It never leaves excess on my skin or leaves it greasy when I come to apply makeup. It really is just my perfect winter moisturiser. The only downside is that I'm not sure it's quite rich enough for truly dry skin. I'm a huge fan of REN's Glycolactic Radiance Renewal Mask, so I had to pick up their latest release. It's also an AHA-based product but instead of being an intensive mask, it's an overnight treatment you leave on your skin. I have to mention that the smell of this is really off-putting; it's orange-y but in a bit of a nauseating way! REN is known for its clean ingredients though, so I guess it's better that they don't use perfumes to mask the natural scent of their products. I apply 2-3 pumps twice a week before bed as the final step in my routine, after using a night cream. As it's an overnight treatment, it's much more gentle that the face mask, however it also doesn't give the same dramatic, immediate results. For me, this is more of a subtle radiance booster that delivers that glow more and more over an extended period of time. It's also great if you have scars or hyper-pigmentation to help even out the skin tone over time. Whilst I still prefer the Glycolactic mask, I really like this for when I don't have time and just want something that will do the work whilst I sleep. Avene has been my go to recently! Love these picks Jamsine! 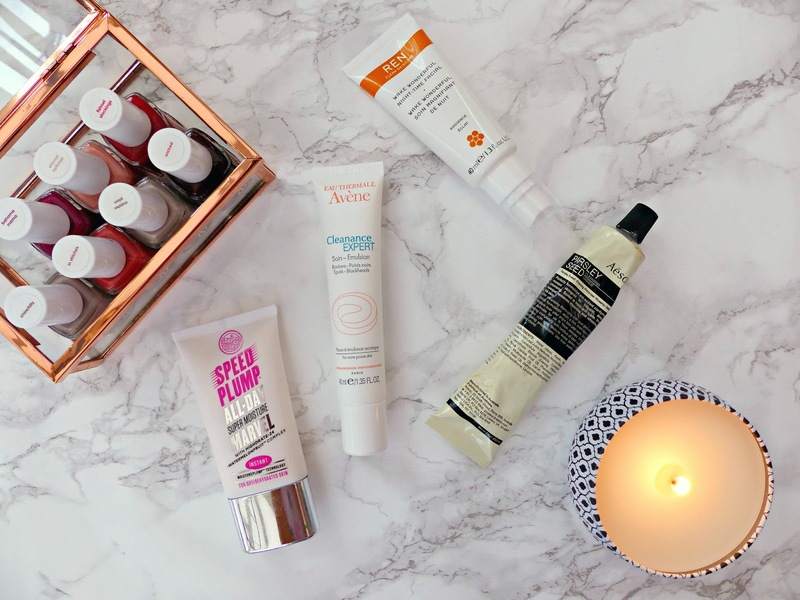 Avene is my favourite for treating spots, it's so gentle yet effective! I've just got the Parsley Seed mask so will have to give it a go tonight! I've been using the Speed Plump too and really like it as a day to day moisturiser, I want to try the night time version now with the hyaluronic acid! These all sound amazing! Thanks for sharing - I too get random breakouts so helpful to find new things to try! I've not tried any of these but I've been eyeing up the Aesop Parsley Seed Mask for way too long. I always end up being a bit underwhelmed by clay masks especially, but I've heard this one is amazing! I've just come across your blog! you do so many lovely posts, i'll have to take time out to look at them all! I have not yet tried anything from Aesop and I would love to!! The REN overnight treatment looks like it would work great but I hate strongly scented products, I still want to try it though. Ah that REN mask sounds pretty interesting, I love anything that fades scars or pigmentation but I may stick with their other Glycolactic mask because I'm a bit impatient and want quicker results! The Soap & Glory moisturizer might be exactly what my skin needs -- my face is always so dry and stubborn this time of year. Ughh, not a fan of the cold. I've used the REN 1-Minute Flash rinse. If you're looking for glowy skin, definitely look into it! I tried a sample not too long ago and it worked so well. Excellent reviews. I love how you're so thorough with everything! I feel like I'm commenting the same thing on all your posts haha but I really want to try the Aesop mask, it sounds perfect for my skin! !